Lead generation is a vital element for the growth of any business. It’s also an element that every business struggles with. Whether it be a constant challenge, seasonally, or simply trying to grow your business. Everyone wants more leads, but it’s just not as easy as it seems. Spending the time to generate business is time consuming and expensive when your focus needs to be on fulfilling work rather than finding it. So, what are your options? Word of Mouth is by far one of the best ways to generate new business, but it is a slow. Although a great organic way to grow your business, you’re only ever as good as your last job and you’re only going to get as many referrals as work you complete. So how do we increase this rate? Cold Calling is one of the oldest and best methods to generate leads…in the business to business world. What about the consumer world? Are you going to call every person, randomly and hope that someone is interested? I don’t think so. Newspaper and magazine advertising has been labelled as a ‘spray and pray’ approach. It definitely gets your name out to the local community, however it is hard to measure the impact of your ad and works as more branding than lead generation. Signage works well too. It is low cost and can consistently deliver you leads once completed. 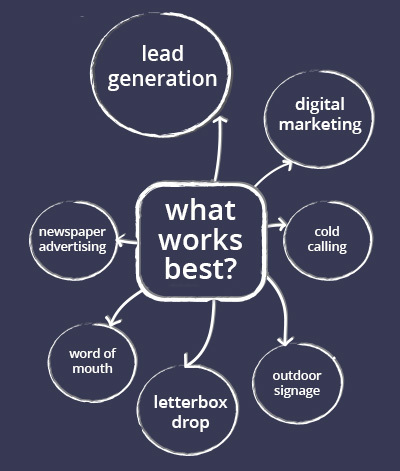 Your audience reach, however, is limited to those driving or walking past your signage, so like referrals, it works well but low reach, not to mention, like newspaper advertising, it’s more branding focused then lead generation. Letter drops. I’m sure you have all tried this at one point or another. It is very effective, cheap, and focused on lead generation. Great. The problem is it is exceedingly time consuming. You’ll notice one thing in common with all of these approaches. They are; hard to measure, not necessarily lead generation focused, time consuming, expensive or all of the above. The last method we are going to cover is a sure-fire method to help you grow your business. 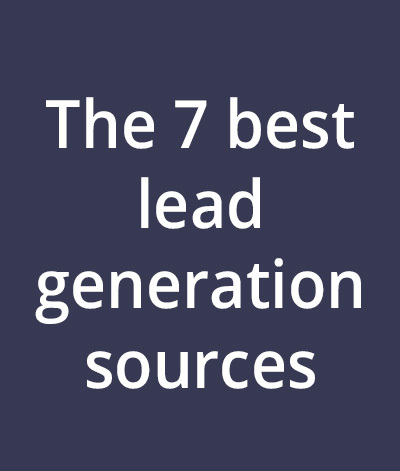 7 Purchasing leads from a lead generation company. It’s a convenient, simple, easy to use and practical solution to the problem of lead generation. Customisable to your specific needs, leads come to you instead of you searching for them. It’s cost effective and easy to measure. Only competing with 2 other companies, your competition is greatly reduced, compared to competing in much larger marketplaces like digital marketing or newspaper advertising. Pick up the phone quickly, provide good customer service and price points and your risk of losing a job is greatly reduced. The way it works, is that we do the advertising for you and you only pay for the customers that you quote. Run by marketers, we use our experience in online advertising to rank high in search engines, optimise online campaigns and attract potential customers. When customers fill out the form on our site requesting quotes, we forward that request on to 3, and only 3 providers. These quote requests get sent straight to your email inbox or to your mobile phone by SMS. By only paying for when you quote your service, it’s easy to track return on investment and grow your business. Pay only when you can quote a customer, no lock-in contracts, and you can set your own service area. Join The Quote Company and start receiving sales leads today.